A state-of-the-art 3-Tesla MRI system that will advance patient treatment as well as research is the latest partnership between Purdue and GE Healthcare. 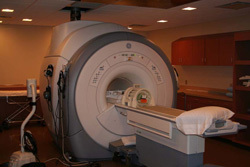 The unit is the centerpiece of a new medical imaging facility that opened on November 2nd. Research teams from Purdue and the Korean Institute of Science and Technology have teamed together to advance molecular imaging and nanotechnology tools to advance diagnosis and treatment of cancer and other diseases. The $4.5 million partnership with the Korean Institute of Science and Technology and the latest chapter in a long-term innovative partnership with GE Healthcare are just two ways in which the Weldon School of Biomedical Engineering is working to advance healthcare, research, and biomedical education worldwide. These unique and critical partnerships are already having a positive impact, and there is more to come. Please let us know if you would like to schedule a visit so we may show you what Weldon has to offer. On behalf of the faculty, staff, and students, I wish you a safe and happy Thanksgiving.